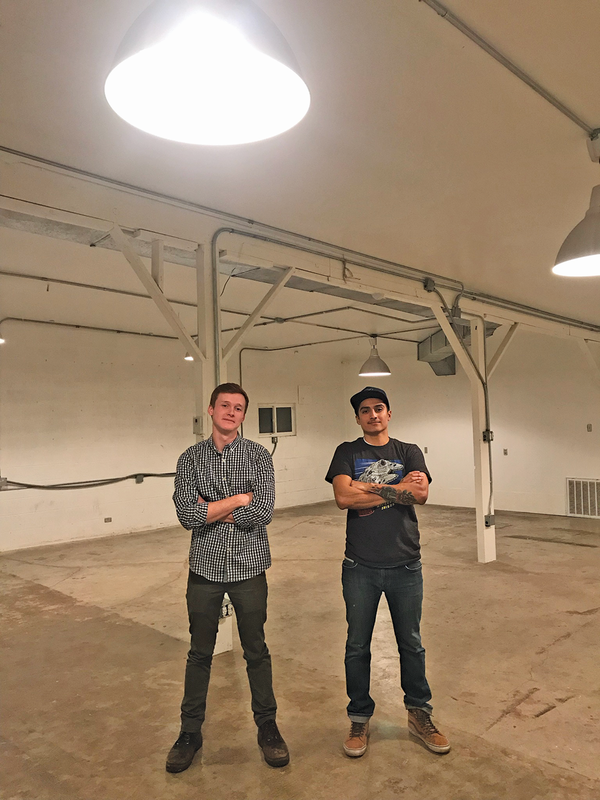 Dalin Shepherd and Albert Vargas breathe new life into beloved Provo venue. Even with the local economy humming, navigating bureaucracies to start a new venture is tough. Multiply those challenges if your business model involves live music, then add a few more levels of difficulty if you don't plan to sell alcohol, and instead are creating an all-ages space open to every type of artist. Oh, and your regular business hours will stretch from just 7-10 p.m. most nights. Such are the challenges facing Dalin Shepherd and Albert Vargas, partners in the second iteration of The Rad Shack. The original Rad Shack started as a practice space for Shepherd's bands Famous Friends and Strangely OK, then morphed into a free DIY venue in the winter of 2016-17 when Muse Music closed. "I was afraid that the Utah County music scene that Muse provided a home for would have no place to go," Shepherd says. "So I opened our space up to host shows, and it quickly gained traction." However, the owners of that property asked Shepherd and his band to vacate in July, giving Shepherd the needed incentive to transform The Rad Shack into a legitimate business. He found the perfect space at 1644 S. State in Provo, just after he met the perfect partner in Albert Vargas, a California native who moved to Utah three years ago to start a family with his wife, Kensy. "Albert was the perfect business partner I didn't know I needed until he introduced himself to me," Shepherd says. The two met through mutual friend Rayn Morrison, who performs as Lyfe on Mars, an example of how local connections have helped incubate The Rad Shack 2.0. A fundraiser last month at Bill's Warehouse, part of Provo's long-running Bill Harris Music, netted $2,150 for start-up costs; an IndieGoGo campaign raised another $1,500. Vargas cites additional support from local bands, artists, friends and other DIY venues like The Superfuzz, while Shepherd acknowledges the complexities that go in to opening a business: "We have enough connections and support to get everything physically tangible to run a live music production, but it's the bureaucracy and business model of keeping a music venue afloat that's the biggest challenge. I don't know how others do it, but we're as ready as we'll ever be to take it on." Shepherd and Vargas bring valuable skills to the table: Shepherd is a draftsman for a Salt Lake City engineering firm and has stints in maintenance, painting, demolition and welding fabrication, while Vargas works for Hydro Extrusions in Spanish Fork, handling extruded aluminum for the construction, transportation and HVAC industries. Even with that wealth of knowledge, Shepherd admits that turning The Rad Shack into a legitimate business is risky. "We weren't about to pull out a bunch of business loans," he laughs. But he says his time running the first Rad Shack served as the perfect testing ground. "It was close enough to a real venue, yet almost entirely risk free," he says. "I went to school at UVU for a short time in their digital audio program, and through that I made connections and found resources that taught me what it takes to do live music. I'm also not afraid to ask questions to anyone I work with." Vargas says several people have come out of the woodwork to offer input on The Rad Shack: "So in a sense, everyone in the local music scene has helped in one way or another." With a capacity of 100-150 and a plan to provide a stage, lights and sound for events, the future looks bright for the new venue. Its grand opening on Nov. 8 features a mix of local bands and touring acts: Colorado's Slow Caves and Flaural joined by Utah's All That Falls, Robots Ate My Garden and RCS. "Slow Caves came through Utah on tour and played the original Rad Shack," Shepherd says. "They liked it enough that they wanted to come back and be a part of the reopening show." All That Falls also has a history of playing at The Rad Shack; Shepherd calls bassist Cubby McBride a good friend and a "fantastic connection to the music scene around here." Ditto for Robots Ate My Garden, whose frontman Luis Puente plays guitar with Shepherd in Famous Friends. Salt Lake City's RCS makes their debut at The Rad Shack, along with Flaural, fellow Coloradoans on tour with Slow Caves. Beyond that, The Rad Shack is already booking through the spring, including a Rad Shack Festival in late May. The stylistic mix includes EDM nights, open mics and solo showcases, with genre diversity a must. "It's extremely rare for me to turn down a band because of the kind of music they play," Shepherd says. "Anyone who wants to play, I want them to play." That egalitarian nature is The Rad Shack's biggest hallmark—along with a commitment to an alcohol-free, all-ages space that abides by the rules. "We respect Provo's sound ordinance, so we'll wrap up around 10 p.m.," Shepherd says. "I feel it'd be unfair to make it a 21+ venue, too, although to be honest, I don't know how any venue stays afloat without selling alcohol. But we're determined to do it well." That determination to survive and thrive in Provo sets The Rad Shack apart. Vargas notes the overlooked talent in Utah County—and the fact that when those bands drive north to Salt Lake City for a gig, they often have to sell tickets in advance to get a spot on the bill. "We want to provide the space for artists to get themselves out there—and for audiences to enjoy awesome music," he says. Shepherd emphasizes that all-inclusive atmosphere. "There's so much talent out there, and although Salt Lake City has plenty of venues, that's not where every single band or artist lives," he says. "Utah County severely lacks in places for bands to perform, and if we can provide that, we absolutely will. You never know who's going to walk up on stage and become the next big thing."